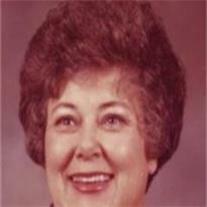 Nadine Magnusson Anderson Harris, beloved wife, mother, grandmother, and great-grandmother, died on December 11, 2011. She was born in Mesa, Arizona on February 17, 1924 to Peter and Lettie Magnusson. Nadine graduated from Mesa High School in 1942, and two years later, she married Robert F. Anderson. They had four children together. Nadine was a gifted pianist and through the years, she devoted countless hours of service accompanying performers of all ages. On the weekends she played in a popular dance band that performed throughout Arizona. After over twenty years playing for Mesa Rotary meetings, she was unanimously brought in as the first woman Rotarian of the Mesa club. Nadine selflessly dedicated her time to the community she loved and always remained active in community affairs. Her service to the people of Mesa won her the city title of Mesa Artist of the Year for 1973. Later in life, Nadine married Tom (Richard) Harris, a friend from high school, and they delighted in sharing memories of their friends and of early Mesa. Nadine was an extraordinary human being whose love and generosity knew no bounds. She was renowned for her sparkling personality, unlimited energy, and matchless zest for life; her radiant spirit illuminated any room she entered. Though she will be greatly missed by her family and friends, Nadine leaves us her enduring legacy of beautiful music, selfless service, and unconditional love. We are all better for having had her in our lives. Nadine is survived by her sister Velda Martz; her sister-in-law, Donna Magnusson; her four children, Fred, Gordon, Kathy (Adams), and Chris; 12 grandchildren and 33 great-grandchildren. Funeral services will be held Saturday, December 17, 2011 at 10:00 a.m. at the LDS chapel at 1249 South 48th Street in Mesa. Viewings will occur at Bunker’s Garden Chapel on Friday night (16th) from 6:00 to 8:00 p.m. and Saturday morning at the church at 9:00 a.m.